Available now and coming out of the blue is eFX Collectibles' latest prop replica -- The Force Unleashed Incinerator Trooper Helmet. 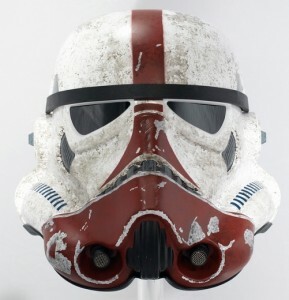 This helmet is exclusive to CozmicToys.com and is limited to 501 pieces worldwide. This PCR helmet is one of the lower detail "stunt" replicas made by eFX, but that also keeps the price very low at only $199.99 plus shipping. Having seen many of these PCR helmets in person they have a great displayability that far exceeds their cost. So if you're interested in this order yours now at Cozmic Toys!